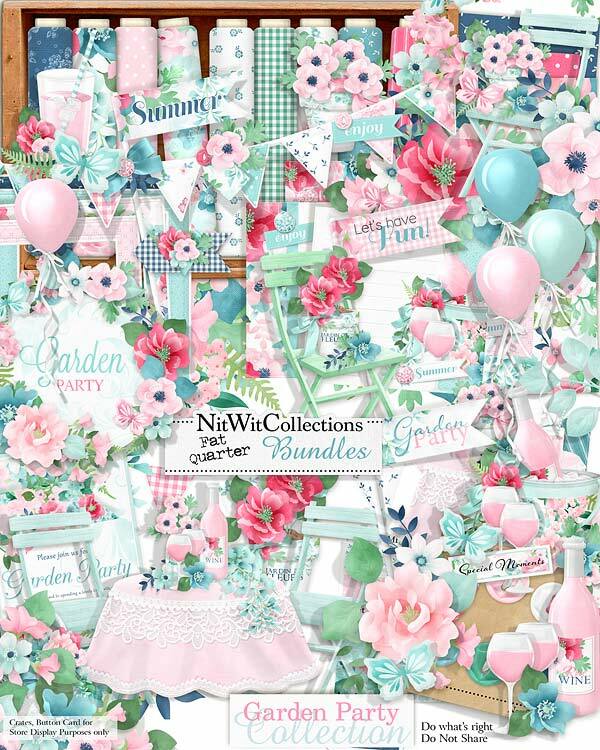 FQB "Garden Party" Collection is a wonderfully colourful digital kit that will make your heart sing and remind you of how you feel spending time in your garden!! This kit is filled with so many festive elements from the balloons and buntings to the patio set and floral clusters that we don't want you think that it is only for a Garden Party! You could easily use this for a birthday, bridal or baby shower, retirement or so many other occasions of celebration that your mind should now be running on overdrive on how best you see creating with it! The soft pink tones paired with the navy blue is such a pleasing colour combination that we are sure that your cards, scrapbook layouts and mini albums will come to life! Welcome to the Creating Party!! 2 Arrow digital elements with floral clusters beautifying their centres! 4 Arrow elements each covered in a different pattern to easily coordinate with your festive cards, scrapbook layouts and mini albums! 3 Balloons with strings attached...stop reading and hang onto the string before it floats away!! 1 Branch filled with pretty little pink blossoms that we're sure you'll find a place for in your creations! 1 Flag element - "Garden Party"
1 Flag element without words so you can use it for any theme! 1 Flag element - "Let's have Fun!" 1 Flag element - "Summer"
1 Garden party invitation! Simply fill in the date and address and mail it off! 1 Journal mat with the wine bottle and glasses - Ahhh "Summer"
1 Journal mat with the chair adorned with the butterfly and flowers...where will you use this?? 5 Journal strips that are blank for you to fill in your personalized sentiment, date, name, etc. 1 Wine bucket scene with the sentiment - "Special Moments"
This product was added to our catalog on Thursday 29 June, 2017.